Andrea Arnold (RED ROAD, FISHTANK) is an exceptional British director - a woman whose films take us under the skin of the characters she is portraying. She isn't a director of dialogue but a director of sensory perception. We hear the wind; dogs scuffling; kisses. We can almost feel the texture of worn clothes; curled hair; ruffled blankets; the mist on our face. We feel the relationship between two people from the way they are in each other's presence, not from the dialogue. And every emotion felt by the characters is mirrored in nature, brought to us with startling clarity by Robbie Ryan's award-winning cinematography. In short, Andrea Arnold echoes the authenticity and heightened sense-perception of Terrence Malick - high praise indeed - but justified. All these qualities make Andrea Arnold the perfect director to take on Emily Brontë's Wuthering Heights - a movie whose characters are so much embedded in the wild beauty of the Yorkshire Moors. Working in collaboration with screenwriter Olivia Hetreed (GIRL WITH A PEARL EARRING), Arnold has taken a bold approach to the source novel. She only portrays the first half of the novel, takes away the framing device of Nelly recounting the story to a traveller, as well as the gothic vision that opens the novel. What this does is allow her to take her time over establishing the central characters and conflicts. The Earnshaw family live in a ramshackle farmhouse on the Moors in the early nineteenth century. The puritanical father brings home a poor young black boy, later baptised as Heathcliff, throwing the elder son, Hindley into brutally violent jealousy and contempt and the young daughter Catherine into a kind of selfish, selfless profound love. When the father dies, Hindley brutalises Heathcliff; and his poor, rough person stands in sharp contrast with the smooth refined Linton family. And so, when Edgar Linton proposes, Cathy accepts, though feeling she is betraying both herself and Heathcliff, who overhearing, runs away. So ends the first hour of the film. In the second hour, Heathcliff has returned a rich man, and Cathy is now married to Edgar. Their love is hemmed in by Edgar sending his sister, Isabella, as chaperone, and when Heathcliff learns Cathy is pregnant, he returns this apparent "betrayal" by seducing Isabella, so setting off a nervous reaction in Cathy. The story is, then, powerful, passionate, violent - filled with supposed and real slights, revenge, and a love so painful to bear it results in self-destructive behaviour. For it to work on screen, we have to feel that visceral connection between Cathy and Heathcliff - we have to believe that their every breath and decision is coloured by the connection. In the first half of the film, I absolutely believe that thanks to some exceptional casting, the portrayal of young Cathy and young Heathcliff sets a new benchmark among the tens of film adaptations. Shannon Beer and Solomon Gave quietly, powerfully, portray a real and charismatic connection - they are quite simply magnetic. Sadly, the movie is let down by indifferent casting in the later scenes, with Kaya Scodelario (Effy in TV's "Skins") and James Howson. I didn't buy into their relationship - Howson was too milksop, too little darkly enjoying his revenge on Hindley, not malicious enough with Isabella - and Scodelario simply didn't have the look of a wild bird tamed, caged - she looked to Isabella-ish! Also, I know we are meant to suspend our disbelief, but the two Cathy's look utterly dissimilar. One feels that better casting would've provided the continuity seen in the Young and Teen Kevins in Lynne Ramsay's WE NEED TO TALK ABOUT KEVIN. 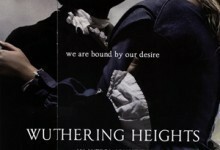 WUTHERING HEIGHTS played Venice (where Robbie Ryan won Best Cinematographer) and Toronto 2011. It opens in the UK on November 11th; in Spain on November 25th; in Slovenia on January 26th; and in Poland on March 23rd.